Created in 2008, SEDI’s latest innovation, the Canadian Centre for Financial Literacy (CCFL) brings together the private, public and voluntary sectors to expand opportunities for low-income Canadians to increase their financial literacy. We are pleased to share the latest news on financial literacy in this third e-newsletter of the CCFL. The CCFL website www.theccfl.ca is up and running in both English and French. The site is a way for people interested in financial literacy to connect and find information. Through it, program facilitators can share ideas with their peers in Canada and abroad via Twitter, Facebook and forums. The site also features the latest news and studies related to financial literacy. The CCFL is currently accepting applications to be a community partner from both organizations serving youth and those serving newcomers, in communities across Canada. If your organization is interested in providing financial literacy supports to your clients, please complete an expression of interest through the CCFL’s website. Brian Smith, through the Carrefour jeunesse-emploi de Côte-des-Neiges, has recently launched a program in Montreal called ‘Money‐Monnaie & Dollars Make Sense’ which provides financial literacy workshops for disadvantaged youth and single mothers in Montreal. Brian credits the CCFL’s director, Casey Cosgrove, with the idea to include financial literacy in his programs with young people at the Carrefour. Casey described the work SEDI was doing with low-income families and Brian immediately saw a connection with his programs. Brian believes financial literacy is an essential tool to combat poverty and his goal is to encourage his clients to start thinking about how money works at an early age. For more information, contact Brian Smith at vibetime@hotmail.com. 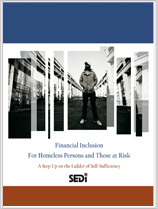 SEDI has just released the report Financial Inclusion for Homeless Persons and Those at Risk: a Step up on the Ladder of Self-Sufficiency which emphasizes the need for suitable policy responses and intervention models to improve the financial literacy and financial inclusion for Canadians who are homeless and insecurely housed. This report identifies the necessity for investment in staff training and organizational capacity building among transitional shelters and rent banks to offer intensive and ongoing financial learning opportunities for their clients. To read the full report visit www.sedi.org. SEDI incorporates access to financial literacy into all of its asset building initiatives as financial literacy is a precondition to successful savings and asset building. It is an essential skill that Canadians require in order to plan and make informed and responsible decisions about how they spend their money. This horizontal approach enables SEDI to fully integrate the lessons learned from all our activities into current and new programs. Peter Nares, Founding Executive Director of SEDI, will be working with the Task Force on Financial Literacy Secretariat, providing strategic advice on key issues in the field of financial literacy. To learn more about the Task Force visit www.financialliteracyincanada.com. The CCFL and the Royal Bank of Canada (RBC) recently launched of the RBC Financial Literacy Project. Through this partnership, staff at more than 75 community organizations serving newcomers to Canada and Aboriginal Peoples will be trained to deliver financial literacy supports and planning tools to their clients on an ongoing basis. The CCFL will deliver facilitator training sessions in 10 Canadian communities. Trained facilitators will then provide financial education and supports to their clients. Through the RBC Financial Literacy Project, 1,500 newcomers to Canada and Aboriginal Peoples will access information and training on financial concepts, will be better equipped to understand the wider impact of personal financial decisions and to understand their rights, entitlements and responsibilities, and will acquire the knowledge, confidence and skills needed to effectively manage interactions with Canada’s financial system as well as public programs and benefits. To participate in this project, please contact Caroline Munshaw at cmunshaw@theccfl.ca. The CCFL and the Financial Consumer Agency of Canada (FCAC) have announced a new initiative which will see FCAC’s life skills resource, ‘The City’, delivered and evaluated in community-based organizations serving youth across Canada. The CCFL will train staff and facilitators from organizations interested in providing financial literacy training in 10 communities across Canada to deliver the ‘The City’, and will generate feedback and evaluation based on this work with both community organizations and youth participants across the country. For more information on this project, please contact Caroline Munshaw at cmunshaw@theccfl.ca. 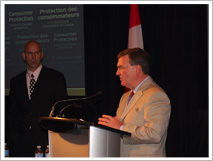 Casey Cosgrove, CCFL's Director, participating in Minister of Finance Jim Flaherty’s news conference on new credit card regulations. 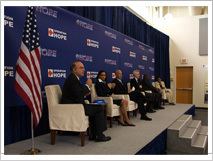 Casey Cosgrove speaking in a panel discussion at Operation Hope’s Global Financial Literacy Summit in Washington, D.C.
A conference exploring financial literacy, individual development accounts and financial asset building strategies will take place in October 19 & 20, 2009 in Edmonton, Alberta. Barbara Gosse, SEDI’s Director of Saving and Asset Building Initiatives, will be presenting at the conference which is sponsored by Financial Plus Asset Building Collaborative. To register for the conference, visit www.financial-plus.org. OCLF has developed a new toolkit designed to help community organizations address financial matters with newcomers to Canada. The toolkit contains background information and materials on banking, credit, income tax, investments, insurance, government support programs, and fraud. The toolkit also includes an online practice ATM and debit card machine. The event launching the toolkit is being held on September 30th from 9:00-10:30 at Causeway Work Centre in Ottawa. For further information, contact George Brown at 613-594-3535 or info@oclf.org. The OECD-Brazilian International Conference on Financial Education will take place on December 15 & 16, 2009 in Rio de Janeiro, Brazil. Participation in the conference is by invitation only, if you are interested in attending, please contact Sophie Saltré at sophie.saltre@oecd.org. New Zealand launched a National Strategy for Financial Literacy in 2008 to set a strategic direction, link providers of financial education and information, increase the quality and quantity of programs, identify gaps and avoid duplication. The Strategy, led by the Retirement Commission (an autonomous crown entity), builds partnerships between sectors. Community partnerships are also developed with employers, unions and industry groups to identify tactics for delivering financial education to their employees. An advisory committee, which monitors progress on Strategy implementation and reports annually to Parliament, is comprised of representatives from industry organizations. National surveys were conducted in 2006 and 2009 by the Retirement Commission (funded by ANZ Bank) to measure the financial knowledge levels of New Zealanders. The results are used to develop financial education programs and will contribute to measuring the effectiveness of financial education in New Zealand.